Can there be joy in the midst of a painful marriage? It’s a hard reality for some-marriage is difficult, disappointing, and painful. Your spouse is unwilling to change. How do you continue, and not just exist but thrive? Men and women in difficult marriages will discover the heart’s ability to remain alive and joyous in the midst of a continually painful relationship with their spouses. Readers are directed away from their spouses’ behavior and brought into a surprisingly free and powerful way to live and to love. 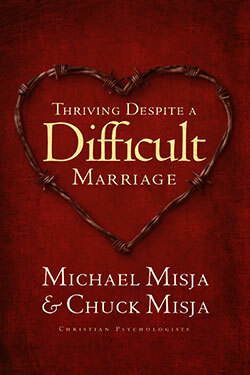 Christian psychologists Michael Misja and Chuck Misja show you how to be free from shame when your marriage is not “successful” by conventional Christian standards. Their practical theology of desire, their explanation of the battlefield of the soul, and their relational process for moving from hoping in your marriage to hoping in God make this marriage book about moving beyond suffering and mere surviving to finding joy and supernatural thriving. Find a basis for joy and learn how to love from godly strength, without asking for a response from your spouse. Availability: Nationwide by appointment and anytime by phone.